In the zone is an introductory striking and fielding activity. 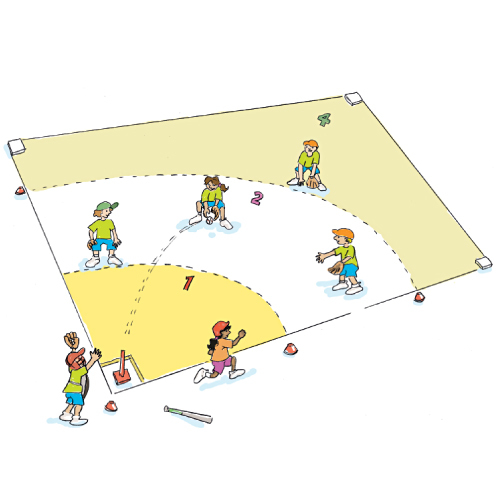 The activity develops batting, fielding and decision-making skills. The batter hits the ball from a batting tee or pitched ball, aiming for a zone that will maximise runs. Fielders use gloves and return the ball to the pitcher. The batter also scores runs for each base reached before the fielder returns the ball to the pitcher. The catcher must wear full catching gear and the batter must wear a helmet. Where should the fielders position themselves to stop the ball? How do you modify your swing to hit the ball into particular areas of the field?